CNN – Fears for the fate of more than 200 Nigerian girls turned even more nightmarish Monday when the leader of the Islamist militant group that kidnapped them announced plans to sell them. Boko Haram is a terrorist group receiving training from al Qaeda affiliates, according to U.S. officials. Its name means “Western education is sin.” In his nearly hourlong, rambling video, Shekau repeatedly called for Western education to end. “Girls, you should go and get married,” he said. The outrageous threat means the girls’ parents’ worst fears could be realized. Parents have avoided speaking to the media for fear their daughters may be singled out for reprisals. The tape won’t intimidate or deter Nigeria from efforts to save the kidnapped girls, the Nigerian government said. “It is disheartening that someone would make such a terrible boast,” Doyin Okupe, spokesman for President Goodluck Jonathan, said in an interview with CNN. But he also criticized the girls’ parents, saying they weren’t cooperating fully with police. “What we request is maximum cooperation from the guardians and the parents of these girls. Because up to this time, they have not been able to come clearly, to give the police clear identity of the girls that have yet to return,” he said. Weeks after the girls’ April 14 kidnapping, Africa’s most populous country seems to be no closer to finding them, triggering complaints of ineptitude — some of which are expressed on Twitter with the globally trending hashtag #BringBackOurGirls. Nigeria’s finance minister said Monday that her country’s government remains committed to finding the girls, but should have done a better job explaining the situation to the public. “Have we communicated what is being done properly? The answer is no, that people did not have enough information,” Ngozi Okonjo-Iweala told CNN’s Richard Quest. Crowds from Los Angeles to London rallied Saturday as well. Former U.S. Secretary of State Hillary Clinton weighed in on Twitter over the weekend. According to accounts, armed members of Boko Haram overwhelmed security guards at a school last month, pulled the girls out of bed and forced them into trucks. The convoy of trucks then disappeared into the dense forest bordering Cameroon. 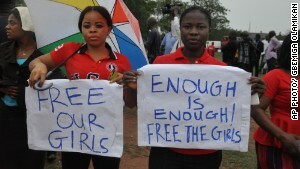 On Friday, Nigerian authorities updated the number of girls kidnapped to 276. At least 53 of the girls escaped, leaving 223 in the hands of their captors, police said. Authorities said the number of missing girls could grow as police fill in spotty school enrollment records. Families had sent their girls to the rural school in Chibok for a desperately needed education. The northeastern town is part of Borno state, where 72% of primary-age children never attended school, according to the U.S. Embassy in Nigeria. It’s even worse for girls than boys. “In the North particularly, the gender gap remains particularly wide and the proportion of girls to boys in school ranges from 1 girl to 2 boys to 1 to 3 in some states,” UNICEF says. Twelve northern states follow Sharia law. In recent years, Boko Haram has carried out dozens of attacks, killing thousands of people at schools, churches, police stations, government buildings and elsewhere. Targets include Christians, senior Islamic figures critical of Boko Haram and people the group believes are engaged in “un-Islamic” behavior, the U.S. Commission on International Religious Freedom says. Boko Haram has gained training in weapons and communications from al Qaeda in the Islamic Maghreb and al Qaeda in the Arabian Peninsula in recent years. This helped it move from little-noticed attacks to more spectacular ones, including against Western targets and the Nigerian government, which it seeks to overthrow, U.S. authorities say. In 2011, it carried out an attack with IEDs on the United Nations headquarters in Abuja. Though Nigeria has Africa’s largest economy, driven largely by oil, poverty remains widespread: Nearly 62% of the country’s nearly 170 million people live in extreme poverty, according to the CIA World Factbook. That dichotomy takes center stage this week as a World Economic Forum meeting convenes Wednesday in Nigeria’s capital of Abuja. The country “already plays a crucial role in advancing the continent’s growth; yet it is also emblematic of the challenges of converting natural wealth into solutions that address persistent social challenges,” the World Economic Forum on Africa says on its website. 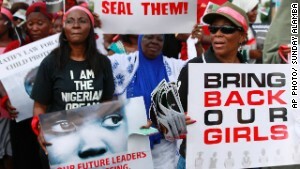 Okonjo-Iweala, the finance minister, told CNN that Nigeria’s intense efforts to find the girls have nothing to do with the high-profile event. Nigerian authorities, she said, are doing everything possible to find the girls — and they’re asking for help. “Any international organization, any country that has different technology, ways of detecting, please let them help us to get these girls back,” she said. The United States is sharing intelligence with Nigeria to help in the search, according to a U.S. official with direct knowledge of the situation. “We are sharing intelligence that may be relevant to this situation. You are going to see a focus on this in all three channels of government: diplomatic, intelligence and military,” the official said, speaking on the condition of anonymity because of the sensitive nature of the information. Police in Abuja denied having arrested a leader of a protest over the weekend that was critical of the Nigerian government’s efforts. In a statement, police said they “invited” Nyadar Naomi Mutah, a native of Chibok, for a “fact-finding interview.” She cooperated and “was immediately allowed to return home to her loved ones,” police said. But Aminu Mahmoud, a lawyer representing Mutah, said her client was arrested Sunday without charge. It was not clear whether that had anything to do with Mutah’s later going to the police station. In its statement on the matter, Abuja police also said security agencies “are leaving no stone unturned” in an attempt to ensure that the children are rescued.